ANDRIY.CO - Translated TCU3 interface to other languages. Translated TCU3 interface to other languages. 1. The interpreter does not have to be programmer. 2. Transfers should be made by filling minimum number of tables. 3. Number of records in tables must also be minimum. 4. The interpreter should be simple and comfortable. 5. Number of questions to the company the developer should be minimum. 6. The result of the transfer of the interpreter must observe directly in their work. 7. The head developer of the result of translation must sent in the form of files after the transfer. From this list of special interest are items 2 and 3. Consider, how to make the smallest number of tables and the smallest number records in the tables. To do this you need to remember what a programming interface. The words or phrases on the buttons and the paragraphs menu, the phrase in the bubble, as well as the phrases in the message. 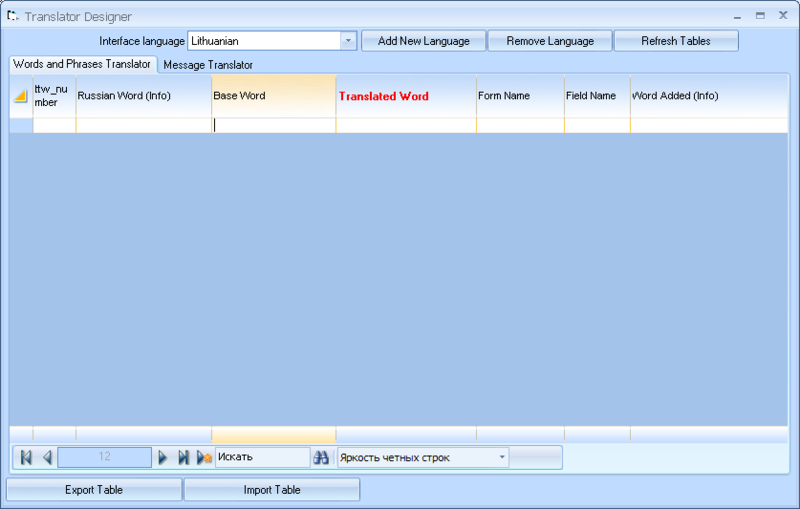 The easiest way to transfer - to create one table and transfer required pieces of text from one language to another. But more depth analysis is that it is not so simple. Simply too many problems. 1. The words or phrases similar in different forms English user interface may have a different interpretation in another language. A simple example. State spending bill and an act of revaluation, if documents are held in English sounds the same - «Approved». But because of the the fact that the word «bill» Women's kind of translation in the form bill is preferable to do as «A», and the act of a re - status is better translated as «A». 2. Communications program - this is not always a static text. In the message must be transmitted parameters. For example, the message «The lack of good 'Match' for shipment». Obviously, that the name of the product for this message can vary, depending from what is not good enough for shipment. Consequently, this parameter is the name of the product must be in some way refer to the message. On this basis, creating two tables. 1. Table translation of words, phrases and sentences. It is based on the principle of rules and exceptions to the rules. For example, in all cases «Approved» translated as «Approved» (this rule), but if the bottom floor is used in the form of spending bill, the transfer should be implemented as «Approved» (this is an exception to the Rules). It must be said that exceptions to the rules occur very infrequently (no more than two or three dozen on the entire table). 2. Table communications. For the most important messages - the numbers. If the translation of words and word program itself is seeking translation and substitutes the words and phrases found in the interface, the for messages TCU is desired text numbers to these messages. Communication with the number 25 in the table contains the following text «Insufficient amount of goods for shipment. »If you withdraw communications program will automatically default to the name instead of tag commodity (in our case, 'Match'). Well, with the construction of defined. Now let's see how this system is live, which is called «in metal». Start TCU. Click on the «References» - the icon «Settings». Now the window settings TCU. Choose a Category «interface». Near Parameter «Language» button «...». A great form of «Translator Designer». The first thing we need to do - add a new language. Click on the button «Add New Language». The system will ask you to enter name for the new language. 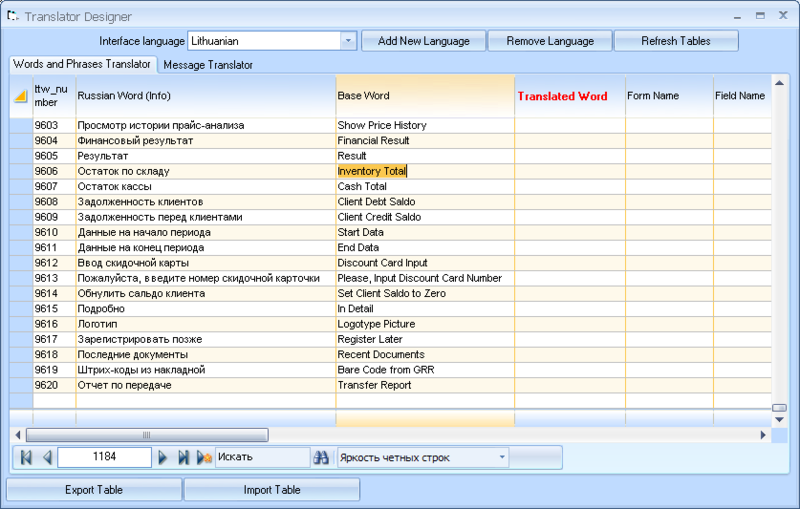 enter the Lithuanian language and click OK. New language is added and automatically selected. Form table is empty. In order to fill it, press the «Refresh Tables». Tables filled. The task of an interpreter - to fill the column with the translation into Lithuanian. The translation is carried out in the column «Translated Word» (the title is highlighted red). In the column «Base Word» is the text by a The interface of the program, which requires translation. This is not always English literature, so the assistance of an interpreter in the column «Russian Word (Info) »made of the translation of the word or phrases in the Russian language translator that can navigate in the translated into their language. In the future, it is planned to «Russian Word (Info)» replaced by the «English Word (Info)», that normally could not work speak Russian translators. Consider an example where we need to transfer rule and an exception to the rule. As we can see, the first Rule «Approved» -> «A», the following line to form akt_per (act of revaluation) and the fields are «utver» (the name of a field in which doing the translation) would be so «Approved» -> «A». The exception - a rare thing, to make an exception of the rules or not - solve the interpreter. To create an exception to the rules need to go to the end of the table and add a new translation indicating the name of the form and name of the field, where this applies exception. Filling in the table translate words and phrases (Words and Phrases Translator) completed the first phase of the transfer. To send the result transfer lead developer, just click on the button «Export Table ». The result of the transfer to the file TTWord.xml, which forwarded to the developer, for example, by e-mail. Turning now to the tab «Massage Translator». 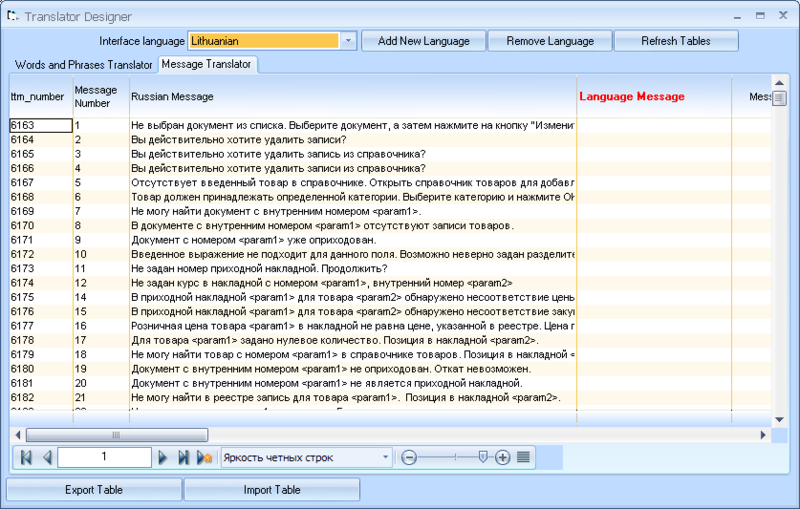 Message Number contains a unique message number, Russian Massage contains an example of the communication in Russian, translated messages recorded in «Language Message». Pay attention to the fact that the message the program parameters that are enclosed in tags <> and which have names , etc. Total message can be transmitted up to eight parameters. After filling the table of messages, data can be unloaded in the form of file by pressing the button «Export Table». File TTMsg.xml sent developer.